Recently, more and more cities are beginning to use apps that help deter food waste while providing discounted food to consumers. Apps such as Montreal’s Ubifood have seen startling success by providing a virtual platform for users to buy discounted surplus food. These programs work to reduce food waste by connecting hungry consumers with willing sellers who have surplus food on the verge of going bad. With this approach, consumers, sellers, and the planet benefit. Set to release a beta soft launch in Toronto this August 2016, Flashfood has similar aspirations to reduce waste, while benefiting both sides involved. “Flashfood is essentially the discount food rack on your cellphone and it’s a means for grocery stores, restaurants, food vendors, being able to resell their surplus food before they’re going to throw it out,” Flashfood CEO Josh Domingues explained in an interview with City TV. Domingues hopes to expand Flashfood Canada-wide and eventually, go global. View the Flashfood website here to sign up for notifications relating to the app’s launch. In 2013, Korea brought into effect the Marine Environment Management Act, banning the disposal of food waste water into the ocean in order to comply with the London Convention. With this new law came a serious crack-down on food waste in Korea. In a small and densely populated country, and one where the standard of living has grown so quickly, waste was becoming a serious problem. New systems were put in place, and now the significance of such changes can be seen. Residents were accustomed to a pay-as-you-go system for waste, but in 2013 this changed from a flat collection rate to a pay-by-weight system for food waste. This was put in place for residents, but also businesses and restaurants. 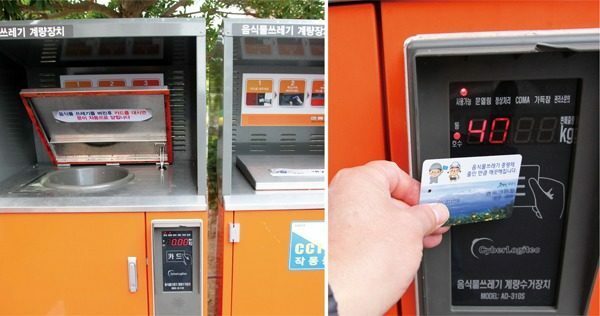 In parts of Seoul, smart disposal systems were implemented where individuals were given ID cards that are scanned before the waste is dropped into waste bins and weighed. In other areas, residents must purchase specific bags that are priced by volume. In the neighborhoods where the smart disposal system has been implemented, Seoul has seen a 30% decrease in food waste. Filmmaker Karim Chrobog has created a short documentary on the changes in South Korea as part of the e360 video series “Wasted” (the whole thing is worth watching). To get a bigger picture of the changes, you can watch the video here. For residents, this strict regulation has created incentives to lower waste (or learn some small scale composting skills! ), but some might argue that it is excessively strict. No one can argue, however, that it hasn’t made a difference: in a relatively short amount of time, waste in neighbourhoods with a pay-by-weight system decreased their food waste by 30%. Not only is the waste being reduced by consumers, the collected waste is not headed for landfill but for animal feed, fertilizer, or conversion to electricity. These laws also target waste across multiple sectors, in contrast to, for instance, the recent law in France requiring only large supermarkets to donate excess edibles to charities. It’s possible too that, as mentioned in the film, food retailers and restaurants concerned with their bottom line will do more to reduce waste, but also might make more of an effort to connect with charities for the waste that still remains. The changes made in Korea do involve high costs and technology as well as some ‘tough love’ – laying down a stricter system – but it seems to be getting the desired results! Former president of Trader Joe’s, Dough Rauch, has opened a groundbreaking new type of grocery store: a non-profit model that tackles food insecurity, reduces food waste, and promotes good nutrition. The Daily Table store opened June 4, after managing to pass the hurdles of non-profit approval and convincing authorities that wasted food can be safe and nutritious food. The shop is located in the low income community of Dorchester, Massachusetts, and provides access to healthy food at very low prices. This new initiative is a major departure from more traditional food charities. It is strongly committed to providing nutritious meals that can compete with fast food in its price and convenience. At the same time the retailer is committed to preventing food waste by collecting donated food and selling it fresh or transforming it into ready-to-eat meals.The shop is challenging cheap, unhealthy calories in a way that is financially and environmentally sustainable while ensuring the health and dignity of its patrons. There are many non-profits that serve rescued food, but the distinction here is that Daily Table allows customers a choice – they are not simply recipients. Being in a retail space enables Daily table to be grounded in the community, provide employment and training, as well as make money to cover costs. I’m excited to see how this project will fare as it employs it’s innovative approach to food waste, nutrition, and food insecurity. Check out a National Geographic interview on Daily Table with founder Doug Rauch here, or more coverage from NPR. Some super creative kids from Lammas School in London have made a song and music video to promote their anti-food waste message. This was created by students who teamed up with the non-profit This is Rubbish at the event “Eat My Words” where students used spoken word and music to create awareness of food waste. Check out their video, you’ll find yourself singing this all day. The Guardian has run numerous articles on the topic of food waste, including one highlighting a few waste warriors in the area of food loss and waste. Check out some inspiring stories about people and organizations who are making a difference in the world of food waste, including charities who rescue food and serve up meals, and tech savvy entrepreneurs who link farmers and buyers or retailers and volunteers for pick ups. Read their stories here. When people are confronted with the enormous problem of food waste in society, one common initial idea is that it should just be collected and given to ‘the poor.’ I remember speaking with a girl in France who was arguing very passionately that the wasted food from supermarkets and restaurants should go to homeless people (and she’s finally getting her wish). However, when I asked if she herself would like to eat that food, she was less than enthused – but still felt that someone else ought to. Of course it may be very well meaning to want to see someone benefit from the waste, but this is problematic because it ignores strategies higher up in the waste hierarchy, namely reducing food waste (then you can use all your saved money to help someone out). It also feels pretty condescending. Who are ‘the poor’? Just because they are in some way disadvantaged, should they be expected to eat what you or someone else has deemed ‘garbage’? Well maybe ‘one man’s trash is another’s treasure’ and ‘beggars can’t be choosers,’ but personally I hope there are approaches that can maintain the recipients’ dignity and perhaps offer a bit more choice. This isn’t an area with easy solutions, although as mentioned one option might be to waste less and use your saved money for donations which give people more power to choose, or food banks the ability to buy what is actually needed. However, even with changed habits at home, businesses are still going to have food that for one reason or another is edible but not salable. How can we de-stigmatize this food? I know from my experience that a lot of the food that comes out the back doors of stores and restaurants is totally edible, so why shouldn’t it go to fill the failures in our food system? Yet things start to get a bit messed up when we start mixing a waste hierarchy with a social hierarchy. The rich eat the organic filet, the lower middle-class the chicken nuggets, and then anyone below that can eat the leftovers and garbage from the above categories, and no need to ask them – they should just be grateful. Umm no. Yet while not that simple or explicit, sometimes it feels that this is how we think food waste should be handled. And this model is clearly not that good for the disempowered people who are given food which, however delicious, was perceived as unfit for others yet good enough for them. So how do we challenge these structures? One way is for ritzy restaurants start serving ‘garbage’ food like monk fish heads, or for food rescue organizations open restaurants or catering companies and serve waste food back to a variety of people. This flips the ideas of who should be eating donated or ‘waste’ food on its head. Rude Food in Sweden serves up delicious meals that are 90% rescued, and it’s not a homeless shelter or inner city feeding program: it’s a catering company. Food Cycle in the UK serves meals of rescued food to people who are food insecure or at risk of social isolation, but they also offer a catering service which then helps employ people and fund other programs.I see this sort of use of food waste as posing a greater challenge to the current system, challenging the idea of who should be eating rescued food, showing that it is good enough for everyone. This is an even more shocking (and hopefully behaviour-changing) idea. So what am I trying to say with this uncharacteristically long post? I haven’t solved this, I am confronted with this issue all the time, but I hope to think a bit more critically about equality and dignity when it comes to food and other donations. How can I treat people with the respect that they deserve, to maintain their rights to dignity and choice while doing my part to create a more food secure and waste-less society? Food waste and food poverty shouldn’t co-exist, but food donations are hardly a panacea either. 1. The data: The stats around food waste are sadly lacking, which can make tackling an issue with so many unknowns a major challenge. Measuring waste both created and avoided is not easy and there is no one way to do so, making comparability an issue. 2. Lack of kitchen know how: People spend less time preparing food than in the past, many ‘normal’ food skills have been lost, and we are no longer adept a making use of leftovers or kitchen scraps. Is it reasonable to tell people to invest more time in preparing their own food? 3. Visibility: Few people are confronted with their food waste in aggregate; not seeing it can easily translate to not seeing it as an issue. 4. Reduce packaging waste or food waste: Sometimes increased packaging can extend the life of food and prevent food waste, but it can also creates waste in other streams. This reveals larger scale issues in our food system: why do we need to make our fresh food last so much longer in the first place? Is our food system too large? 5. Cheap food: Cheap food may be seen as a way to make calories accessible and affordable to more people, however, cheap food can contribute to food being undervalued and then wasted. However, few people would feel right saying that making food more expensive is the solution. 6. Policy approach: Voluntary agreements or landfill bans? Food waste can be tackled by different approaches, depending on political opinions. A big part of the debate is whether changes should be voluntary or enforced. In some places this may mean focusing on encouraging change in the private sector or educating the public as opposed to requiring source separation or banning organics from landfills. Changing people’s behaviour to decrease food waste and to manage residual organic waste is not a simple task. If anything, the outcome of this panel discussion shows that food waste isn’t such a easy matter. One problem can have many potential solutions, all with different ramifications.